The AC-LN air cooler series can be used in all areas where either oil or water-glycol is to be cooled with air. 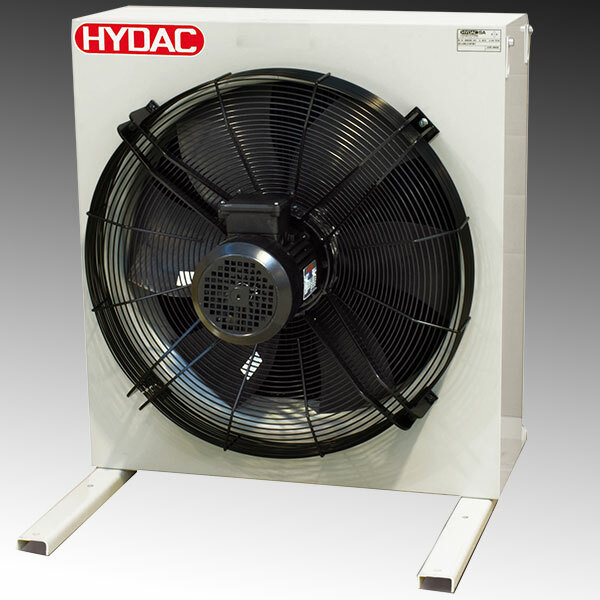 The coolers with an axial fan can be used in the return line as well as in the bypass flow. The wide range of accessories and optional versions mean that the coolers can be adapted flexibly to various applications. Moreover, the optimisation of the air flow of the cooler is possible by using a more efficient axial fan and a variety of housing modifications. As a result, the AC-LN series 2-14 is especially efficient and quiet. We can also use the cooler in the bypass flow by attaching a boost pump. On the other hand, an additional filter enables continuous filtration of the medium; the cooler can, therefore, be connected as required. IBP3 indicates cooler comes with bypass. *** High viscosity option available on request. HYDAC recommends the installation of this cooler with flexible connection type (hoses). In applications where not possible, use rubber bellows at the inlet and outlet ports.